I compared OpenJDK 12 and Oracle JDK 12. TL;DR: There is no relevant difference other than the license. The downloads for OpenJDK 12 and Oracle JDK 12 can be found at [OpenJDK12Download] and [OracleJDK12Download]. OpenJDK 12 does not come with man-pages. That's weird, and this must be a bug in OpenJDK. The legal files differ, obviously, because of the different license terms and conditions. The technical contents of the header files in the include/ directory are identical. The header files differ in the license terms. The header files in OpenJDK are GPL2, the header files in Oracle JDK refer to the proprietary license. OpenJDK 12 and Oracle JDK 12 contain exactly the same list of modules. The modules themselves are almost identical. Without verification, I would assume that these classes, especially sun.usagetracker.UsageTrackerClient, are related to verifying the subscription for the Oracle JDK. There might be differences which are one level deeper than the level that I've analyzed so far. For example, some classes might have symbols which are present in only one of the JDKs and not the other. The announcement that OpenJDK and Oracle JDK are converging turns out to be true. 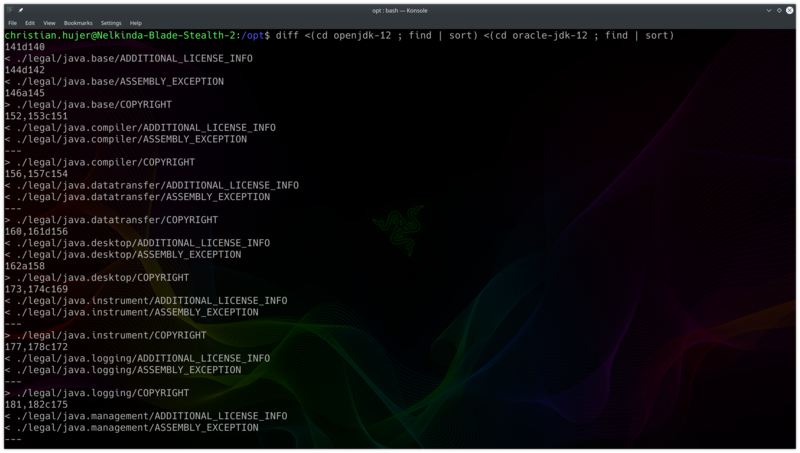 Other than the license, I could not find any significant differences between OpenJDK 12 and Oracle JDK 12.